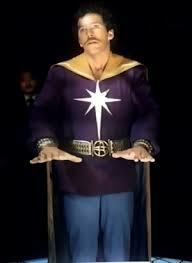 Early attempts to bring Marvel's Sorcerer Supreme to video didn't really pan out. Marvel Comics' point-men in Hollywood spent the mid-to-late 1970s trying and failing to replicate the unexpected mega-success of the live-action Incredible Hulk TV series, constantly looking for ways that their various other characters could be retrofitted into weekly prime-time success. What they kept missing was, in retrospect, simple: The Hulk "fit" on a grownup-targeted nighttime series because he wasn't a superhero -- a character type that, at the time, hadn't precisely figured out how to "work" simultaneously as characters for children/teens and adults in terms of mainstream viewership. Doctor Strange! "Superhero?" Ha! No, no. He's a wizard -- everyone's heard of wizards! The "other" great co-creation of Stan Lee and Steve Ditko, Doctor Strange was conceived as an attempt to revive the pre-WWII pulp/radio-serial tradition of heroic magic-users like Chandu the Magician for a modern audience and spun off into something much more... well, strange -- drawing visual and thematic inspiration from sources like 50s neo-occultism, psychedelic and "Beat" artwork and New Age spiritualism. It's a big idea with a great hook: Stephen Strange, a brilliantly-skilled but arrogant and fast-living surgeon, loses his precise hand dexterity (and thus his livelihood) in an accident. Seeking a magical cure from a Himalayan mystic called "The Ancient One," he instead finds himself drafted to become the new Sorcerer Supreme, a master of the magical arts charged to defend Earth from supernatural threats. In theory, this is all stuff that translates exceptionally well to a non-comic setting freed of even tangential superhero baggage. A wizard keeping modern NYC demon/ghost/etc-free? Yeah, that's a show. ...not much of anything, actually. Seriously. Of all the Marvel TV projects I've watched (or will be re-watching) for this series, Dr. Strange is the most difficult to get through. It's hard to believe, but its opening moments where evil sorceress Morgan la Fey (Jessica Walter -- yes, Lucille Bluth and Mallory Archer) stands on a soundstage representing an alternate dimension that wouldn't have passed muster on Lost in Space while conversing with a deep-voiced demon shrouded (badly) in red fog turn out to be the visual high water-mark of the piece. The storyline proper bears almost no resemblance to the Strange of the comics, to the point where one could be forgiven for not realizing what it was supposed to be. In this version, Strange (played by character-actor Peter Hooten in a rare lead turn) is a psychiatrist and ladies-man in the proud 70s TV-doctor tradition -- a rebel who clashes with hospital brass over his apparently controversial approach of trying to understand and talk it through with the mentally-ill rather than medicating and dumping them into the asylums, and he gets back at said brass by... sleeping with everyone woman who shows him even mild interest and constantly being late for work. As it happens, Strange's inherited signet ring marks him as the successor to Thomas Lindmer, the current Sorcerer Supreme (John Mills), whose advancing age is interfering with his mission to protect Earth from la Fey and... whoever that is she's working for. Morgan possesses a young woman named Clea (Strange's early love-interest from the comics) to try and kill Lindmer, which not only fails but leaves her traumatized and in Strange's care -- giving Lindmer cause to show up and reveal himself, his powers and Strange's destiny to the Doctor.